Let Us Show You How To Set It & Forget It. 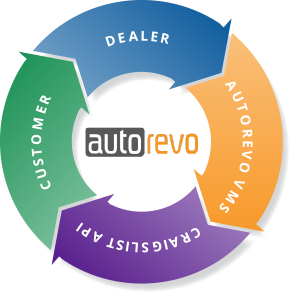 With AutoRevo’s integrated tool, Craigslist posting has never been easier to manage. Try the tool for 30-days and we will waive our posting fees*. *Offer available through Dec 31, 2018. Craigslist posting fees still apply. Offer is valid with new active AutoRevo VMS subscription only. START A CHAT SESSION BY CLICKING THE “LIVE CHAT” BUBBLE. † Active markets immediately available: Dallas/Fort Worth TX, Houston TX, Oklahoma City OK, San Antonio TX. Other markets available within 48 hours of request. List of available territories.